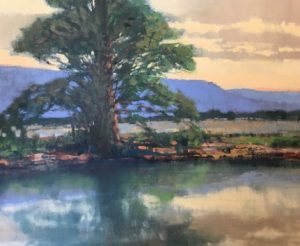 Description: For an artist painting the Tennessee landscape one of the greatest elements you can capture are trees. Here in the South trees captivate artists in every season with their soft spring auras, the lush greens of summer, their vivid fall foliage and the lovely long winter shadows. In this class students will explore how to accurately place trees in the landscape and paint them as they change throughout the year. (Karen uses an expanded limited palette… Titanium white, Cad lemon pure, Indian yellow, Cad red light, alizarin crimson, transparent red oxide, ultramarine blue, cobalt blue, cerulean blue. Please pack a lunch! Bring your field chair!